New data from ESA's Herschel Space Observatory have revealed surprisingly large amounts of cold dust in the remnant of the famous supernova SN1987A, which is located in the Large Magellanic Cloud, a neighbouring galaxy of the Milky Way, and was first observed 24 years ago. With this discovery, the astronomers confirm that supernovae are able to produce significant quantities of dust over very short time scales. This may help explain previous observations, by Herschel and other observatories, of abundant dust in the early Universe as seen in high-redshift galaxies. The results are published online today in Science Express. The Herschel spacecraft against the Rosette molecular cloud. The Herschel Space Observatory has opened a new window on the Universe, by revealing the cosmos at far-infrared and sub-millimetre wavelengths - a spectral range characterised by strong emission from cold cosmic dust mixed with molecular gas. While only a trace component in terms of mass, cosmic dust is a crucial constituent of galaxies and is strongly tied to the life cycle of stars. Dust is created around stars and is particularly important in the context of star formation, as it plays an active role in molecular clouds where stars are born; moreover, it is on dust agglomerates that, during the star formation process, the seeds of planetary systems take shape. Previous observations of galaxies at high redshifts have demonstrated that dust was already present in the early Universe. Cosmic dust consists of small, solid grains that contain a variety of heavy elements including carbon, silicon and iron: its formation must have followed the onset of the earliest generation of stars, where such elements were synthesised for the first time. When exactly the 'dawn of dust' took place in cosmic history is still a matter of debate, and the details of the processes that create dust grains remain unclear. The first stars that exploded as supernovae only a few hundred million years after the Big Bang are suspected to be the sites of early dust formation. Whether supernovae are actually able to produce enough dust to match the amounts detected in high-redshift galaxies, however, has long remained in question. New data gathered with Herschel have shown that this may indeed be the case. "Interestingly, this brand new clue does not come from observations of very distant galaxies, but from one of our closest galactic neighbours," comments Mikako Matsuura from University College London, in the UK. Matsuura is the lead author of a study which is to be published in the journal Science, presenting the analysis of dust emission from the famous supernova SN1987A. This object resides in the Large Magellanic Cloud, one of the dwarf galaxies orbiting the Milky Way, and it was first seen from Earth 24 years ago. Because of its proximity, at a distance of only 160 000 light years, this backyard supernova has become a 'local' laboratory for close-up studies of stellar demise. The region around Supernova 1987A as viewed by Herschel (left) and Hubble (right). "With SN1987A, we can investigate details that are almost impossible to discern in supernovae inside more distant galaxies. This helps us improve our understanding of these stellar explosions, which we can then apply to the broader context of galaxy evolution," adds Matsuura. The observations were performed as part of the HERschel Inventory of The Agents of Galaxy Evolution in the Magellanic Clouds (HERITAGE) Key Programme, a survey designed to probe star formation in both the Large and the Small Magellanic Clouds. "We didn't expect to see SN1987A when we planned the survey," explains Margaret Meixner, HERITAGE Principal Investigator from the Space Telescope Science Institute in Baltimore, USA. "Based on our existing knowledge of dust in supernovae, we could not have anticipated that Herschel would have detected this source. It has definitely been one of the biggest surprises of our project," she adds. The emission from warm and cold dust in Supernova 1987A. 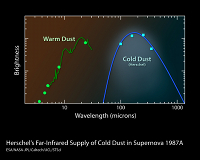 The detection of SN1987A with Herschel demonstrates that this object contains roughly 1000 times more dust than indicated by much earlier observations performed in the near- and mid-infrared wavelength ranges. Based on the new data, the amount of dust present is estimated to be nearly equivalent to the mass of the Sun. 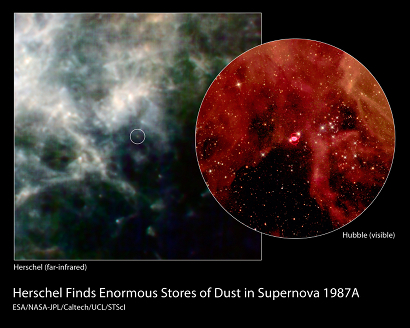 Apart from demonstrating that SN1987A contains more dust than expected, the Herschel measurements have uncovered another important fact. At temperatures of 16-23 Kelvin, the newly discovered component is about 20 times colder than any dust detected in the past in this supernova remnant. Previous observations conducted at infrared wavelengths either did not have the right spectral coverage or sufficient sensitivity to observe this emission. "Since no facility comparable to Herschel has existed during the past two decades, we cannot say for certain whether this large amount of cold dust was produced recently or whether we have observed it only now because we are finally able to spot it with Herschel," notes Matsuura. But this does not bring the importance of the result into question. "We have proved that a supernova can produce an amount of dust comparable to the mass of the Sun over a period of, at most, a couple of dozen years - a blink of an eye with respect to a star's lifetime," she adds. The progenitor of SN1987A was a blue supergiant star with a mass of 18–20 solar masses. More massive stars are believed to produce even larger quantities of dust. This study clearly demonstrates that the first supernovae appear to be extremely efficient dust factories and could therefore be the main sources of the dust found in high-redshift galaxies. The emergence of large amounts of dust in the early Universe must have had a profound impact on the overall dynamics of star formation, as dust is crucial to the cooling of molecular clouds, by increasing the efficiency and pace of stellar birth. "This result, based on measurements performed in our cosmic backyard, provides a possible explanation for Herschel's observations of dust in very distant galaxies," remarks Göran Pilbratt, Herschel Project Scientist. "This demonstrates how the observatory allows us to build a deeper understanding of how the Universe has evolved over cosmic time," he concludes. The data for this study were gathered as part of the HERschel Inventory of The Agents of Galaxy Evolution in the Magellanic Clouds (HERITAGE) Key Programme, a uniform survey of the Large Magellanic Cloud, the Small Magellanic Cloud and the Magellanic Bridge. The survey targets the far-infrared and sub-millimetre emission from dust grains, which is an effective tracer of the coldest dust in the interstellar medium, the most deeply embedded young stellar objects, and the dust ejected over the lifetime of massive stars. HERITAGE will bridge the gap between Herschel studies of the Milky Way and those of nearby galaxies, and will provide a template for high-redshift galaxies. 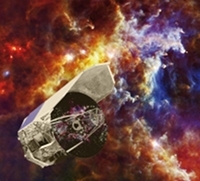 Herschel is an ESA space observatory with science instruments provided by European-led Principal Investigator consortia and with important participation from NASA. The study presented in this article is based on observations performed with the PACS and SPIRE instruments on board Herschel. The PACS instrument contains an imaging photometer (camera) and an imaging spectrometer. The camera operates in three bands centred on 70, 100, and 160 μm, respectively. PACS has been developed by a consortium of institutes led by MPE (Germany) and including UVIE (Austria); KU Leuven, CSL, IMEC (Belgium); CEA, LAM (France); MPIA (Germany); INAF-IFSI/OAA/OAP/OAT, LENS, SISSA (Italy); IAC (Spain). This development has been supported by the funding agencies BMVIT (Austria), ESA-PRODEX (Belgium), CEA/CNES (France), DLR (Germany), ASI/INAF (Italy), and CICYT/MCYT (Spain).